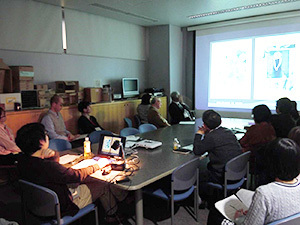 A seminar was held in the Seminar Room in the Department of Art Research, Archives, and Information Systems starting at 2:00 PM on March 24 (Tues.). The seminar featured a research presentation from KAWAI Daisuke, an Associate Fellow of the Department of Art Research, Archives, and Information Systems, on “Anti-art, De-subjectification, and Anonymity: Focusing on the Yamanote Line Event and AKASEGAWA Genpei” and a research presentation from KIKKAWA Hideki, another Associate Fellow of the Department of Art Research, Archives, and Information Systems, on “A Panorama of Sightseeing Art at Tama: Mount Fuji, locomotives, girls, and wells”. KAWAI’s presentation mentioned the “de-subjectification of works,” which is one of the features common to art from around the world in the 1960s. This “de-subjectification” became evident as “anonymity” in Japanese art of the period. KAWAI substantiated this point through an analysis of materials related to the Yamanote Line Event put on by NAKANISHI Natsuyuki and other artists in 1962 and the activities of AKASEGAWA Genpei at the time (since AKASEGAWA was affected by the Yamanote action). KIKKAWA’s presentation covered An Exhibition of Sightseeing Art at Tama, which is the first event put on by the Tourist Art Research Institute. KIKKAWA used the drawing A Panorama of Sightseeing Art at Tama and the video piece Das Kapital by NAKAMURA Hiroshi to look back at the exhibition. 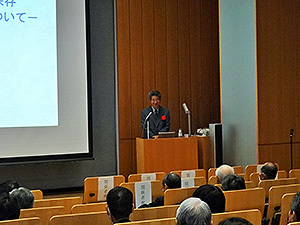 KIKKAWA’s presentation included information that was presented at a symposium commemorating the 10th anniversary of the establishment of the PoNJA-GenKon listserve in September of last year as well as subsequent research he had done. The seminar was attended by the painter NAKAMURA Hiroshi and the artist and post-war art researcher SHIMADA Yoshiko. NAKAMURA arrived after KIKKAWA’s presentation and provided attendees with an explanation of the Tourist Art Research Institute and his own work at the time in a question-and-answer session following the presentations. Bijitsu Gaho(The Magazine of Art) is an art journal that was first published by Gahosha as Nihon Bijitsu Gaho in June 1894. In addition to “new works” by artists at the time, the journal also featured artworks and handicrafts dating from before the Edo period as “reference works.” The journal provides a glimpse into what works were considered classics in the Meiji era. The name of the journal changed to Bijitsu Gaho in 1899, and the journal continued publication until 1926. A database featuring images from Nihon Bijitsu Gaho and Bijitsu Gaho is now available for public access via the Institute’s website. The database allows searches by the names of artists and the names of pieces. 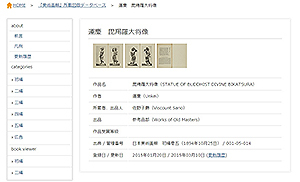 The database currently contains images from Japanese Art Pictorial Vol. 1, No. 1 (June 1894) to Vol. 5, No. 12 (May 1899). Plans are to make images from subsequent volumes available as well. In addition, volumes prior to Vol. 3, No. 12 (June 1897) can be viewed with a book viewer, which users can peruse like flipping through a book, so we invite you to have a look. KUNO Takeshi left an indelible footprint on the history of Buddhist sculpture. KUNO’s collection has been organized, and a catalogue of photographs and other images of Buddhist sculptures in Japan and elsewhere around the world is now available to the public. The collection is massive, with more than 7,000 images, and was assembled by KUNO, who was a researcher at the Institute. After KUNO passed away in 2007, his family donated the collection to the Institute. KUNO joined the Institute of Art Research (the forerunner of the National Research Institute for Cultural Properties, Tokyo) in 1944, and he researched history of Buddhist sculpture for 38 years until he retired in 1982. After retiring, he founded and sponsored the Buddhist Art Research Institute near his home. He collected materials over a number of years and made those materials available for use by researchers (a brief biography of KUNO can be found at the link below). Most of the photographs are of Buddhist sculptures that have been categorized by the temple or shrine where they are found in prefectures and major cities. 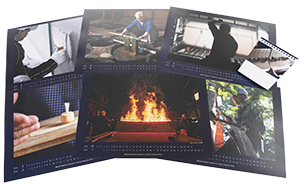 Providing an extensive view of Buddhist statues throughout Japan, the photographs convey the zeal of an extraordinary person. The photographs are extremely important materials and include images of Buddhist statues as they were being restored. KUNO oversaw the editing of A Compilation of Buddhist Statues (Gakuseisha), and some of the photographs can be found in that work. A Compilation of Buddhist Statues features descriptions of major Buddhist statues in different regions. The catalogue allows searches by the name of the shrine or temple where the statue is found and by the name of the piece. If you would like to view this collection, please fill out the Application for Use Form (word / PDF) and submit it to the Library. 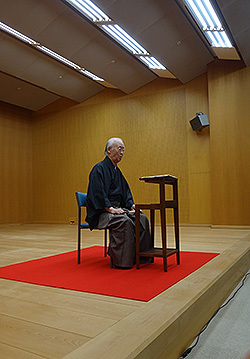 Noh chants from Sotoba Komachi were performed by the preeminent SEKINE Shouroku, a lead actor in the Kanze school of Noh, and recorded on March 13. A Noh play intended primarily for the initiated, Sotoba Komachi features the part of an old woman that can only be performed by veteran actors with years of experience. Somewhat more complex techniques than are normally used are used to portray the old woman’s mindset. Plans are to continue with this recording work after April and record the old woman’s part. 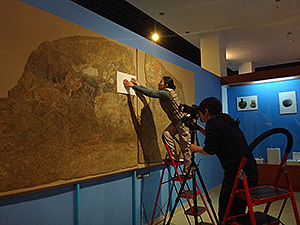 From March 3 to 8, unearthed mural painting fragments were researched, pieced back together, and photographed at the Tajikistan National Museum, the Khulbuk Museum, and the National Museum of Antiquities of Tajikistan. Four mural paintings (dated to the 7–8th centuries) that were unearthed at the site of the medieval fortified town of Penjikent in Sogdiana are being stored and exhibited at the National Museum of Antiquities of Tajikistan. These are a valuable scholarly resource given the limited number of similar paintings. The painting techniques and the state of their conservation were researched and the paintings were photographed in detail in order to better understand their value in terms of art history and the state of their conservation. Fragments of mural paintings (dated around the 10–11th centuries) were unearthed at the Khulbuk site in the early 1980s. Since then, those fragments were simply stored in the Khulbuk Museum without any effort to piece them back together. During the research, these fragments were pieced back together and photographed. 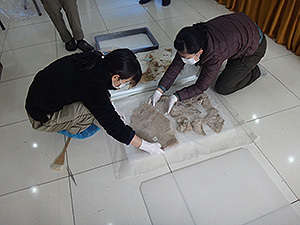 The mural painting fragments had been piled up in a wooden box for storage, so work began by transferring individual fragments to a plastic container and assigning each fragment a reference number. Fragments in each container were photographed and the condition of each fragment was recorded to provide basic information for use in conservation work. Fragments of mural paintings (dated around the 8th century) from the Kala-i Kakhkakha 1 site are being stored and exhibited at the National Museum of Antiquities of Tajikistan. The current condition of them was recorded, and the fragments were visually inspected in detail. The results of this study should effectively facilitate future conservation of mural painting fragments in the Republic of Tajikistan. Japanese artworks in collections overseas play an important role in introducing foreigners to Japanese culture. However, there are few conservators of Japanese works overseas, so numerous works are not ready for exhibition, and those works are not properly conserved. 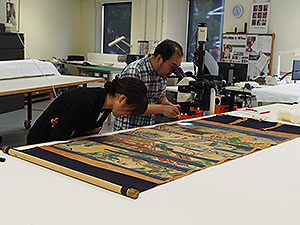 The Institute conducts the Cooperative Program for the Conservation of Japanese Art Objects Overseas so that these Japanese artworks can be conserved and exhibited. The program facilitates cooperation in conservation of works overseas and it conducts workshops in an effort to conserve and restore such works. The current survey examined Japanese paintings in Australia in order to identify works for future conservation by the cooperative program. From March 16 to 19, Institute researchers visited the National Gallery of Victoria and the National Gallery of Australia. The National Gallery of Victoria in Melbourne is Australia’s oldest art museum while the National Gallery of Australia in Canberra boasts the country’s largest collection of art. During the survey, the detailed state of hanging scrolls, a hand scroll, and folding screens (8 works in total) were examined and the works were also studied from the perspective of art history. The works will be assessed in terms of art history and works in need of urgent conservation will be identified based on the results of the survey, and works will be selected for conservation under the cooperative program. In addition, information gleaned from the survey will be provided to the curating institution in order to formulate future plans to exhibit and conserve the works.